This post was sponsored by Hasbro as part of an Influencer Activation for Influence Central and all opinions expressed in my post are my own. 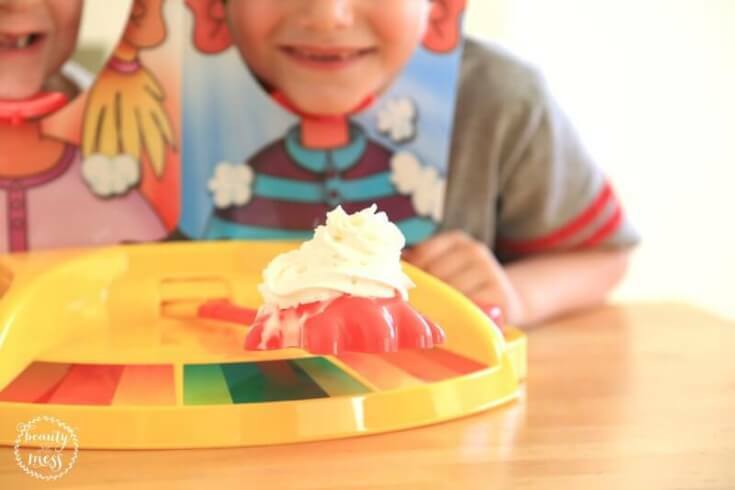 Family Fun Game Night has been taken to a whole new level with the newest version of the Pie Face Game, Pie Face Showdown. It’s the ultimate showdown between siblings as brothers and sisters compete in a button mashing tug-of-war that ends with someone getting Reddi-wip (not included) in the face. 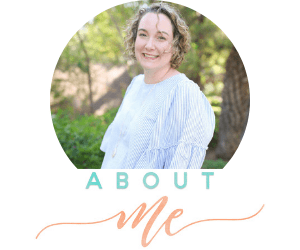 With the transition to a new city, starting public school for the first time, and a getting accustomed to a new work schedule, like has been a little crazy. We’re like ships passing in the night with not much time to connect as a family. It was starting to get noticeable with emotional meltdowns, short tempers, and unkind behaviors. We needed something to bring us back together as a family. Something fun and new. Something to make us laugh. Laughter is the best medicine. 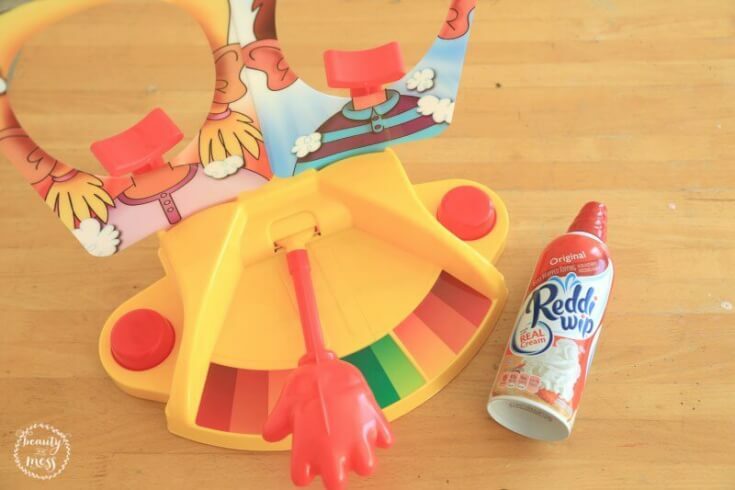 What could be more fun that a nice friendly competition where someone gets hit in the face with Reddi-wip? Nothing! Setting it up was easy. The hand easily attaches to the lever and the face mats slip nicely into the holders. Reddi-wip isn’t included so you do have to buy that separately, but it’s worth it. Just a note, buy at least TWO cans, if not more. I left it on the counter so every could see the game and try it out without the Reddi-wip first. It built up the anticipation quite nicely. Every day they would ask if it was time to play Pie Face Showdown. I was nervous. The last thing I wanted was a fun game night to turn into mass chaos because someone didn’t realize they were going to get messy. Honestly, I had no idea how my children would react to getting Reddi-wip in the face. Sensory issues run strong in our house and competition can turn ugly fast. They are siblings, and while they love each other most of the time, everyone has their moments. 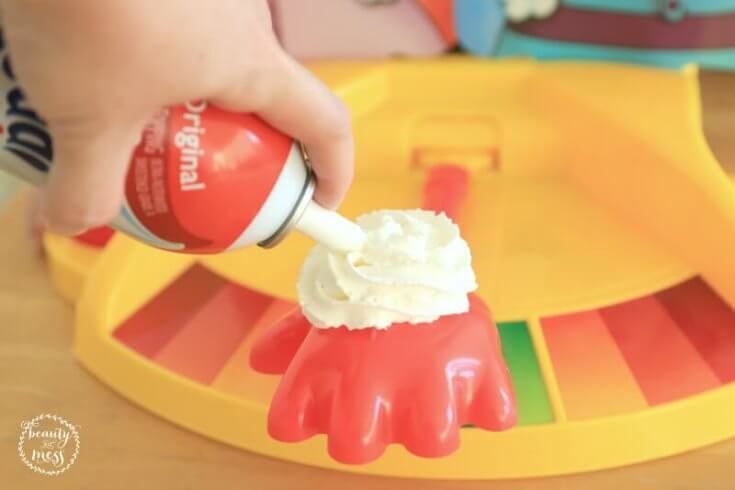 It turns out, EVERYONE loves getting Reddi-wip in the face. 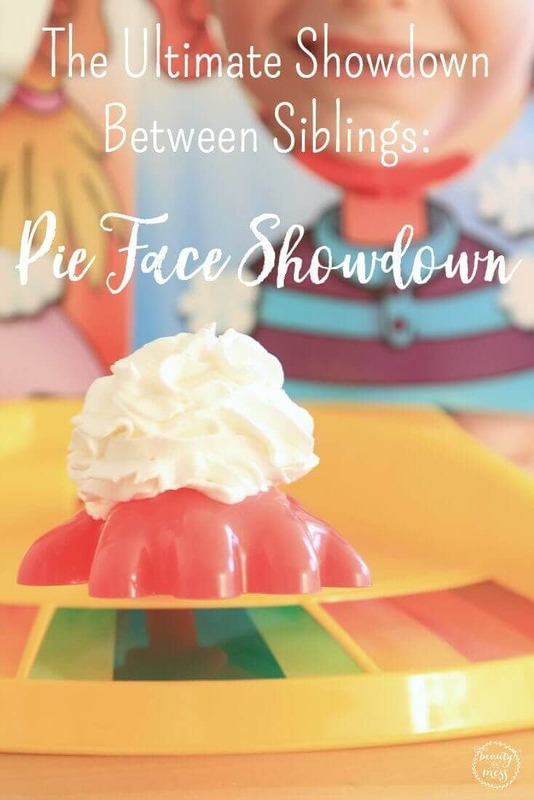 The Pie Face Showdown game adds a new layer of fun and competition when two players face off to see who can hit their button the fastest. It is a great way to stir up some friendly competition among family members. It’s not just for kids! Parents can play against children and each other. We did both, but the pictures and video didn’t turn out. So sad. Thankfully, I’m not the one who got Reddi-wip in my face. HA! It was SO MUCH FUN! 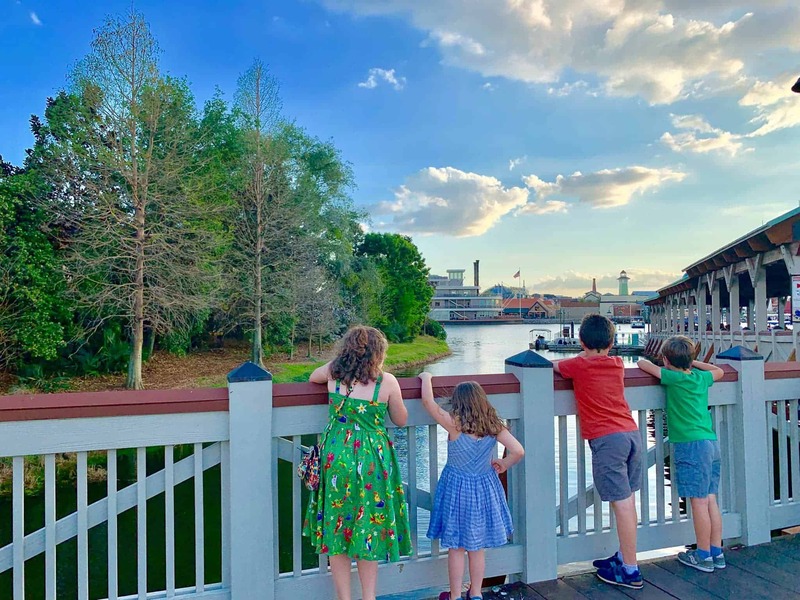 We loved spending time together as a family and enjoying a time of fun and laughter. That’s doesn’t always happen with our crazy schedules. 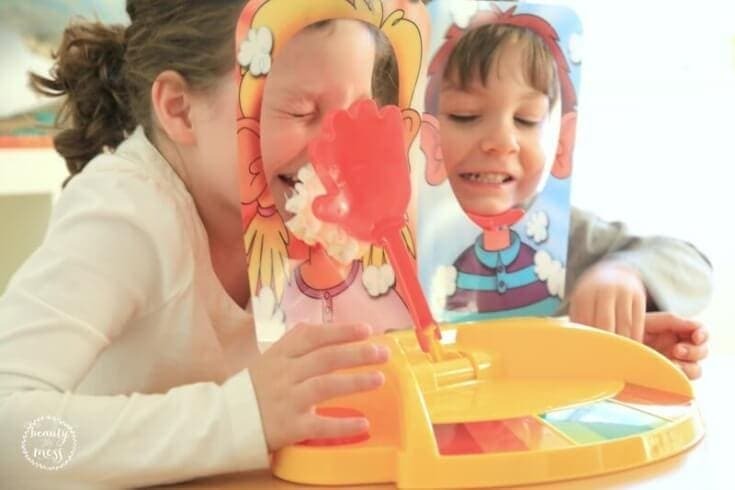 At just under $25, Pie Face Showdown makes a great holiday gift that the whole family can enjoy. But you won’t want to wait that long. Buy it October 1st and have it ready for entertaining friends and family during the holiday season. We have played Pie Face Showdown numerous times since we opened the box. While we do have other games in the house, this is the most requested. It’s fun. It’s friendly competition. It’s Reddi-wip. Can it get any better than that? !